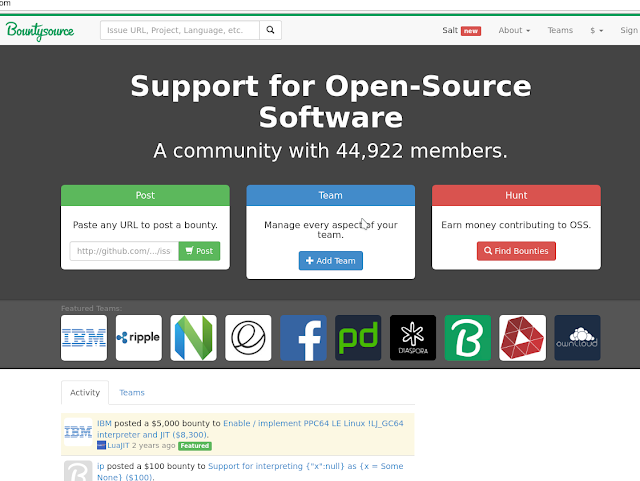 There's a bunch of websites that let you become a backer of open source software or back an issue. In my opinion trying to get "funding" from these is a complete a waste of time and effort. Generally speaking, the providers of these services and only a small portion of the users benefit and make any the money. Lets look at a few numbers to see why. On their home page you see the estimated annual budget, currently at $525k / year and 309 projects. Wow $525k! But wait, scroll down to the collectives and you see webpack is getting about HALF of that ($241k). So do the math if we exclude the outlier (webpack) the average project makes a whopping $920 per year or about $80/month. The average US engineer will make that monthly amount in about 1-2 hours. Most of these open source projects I'm sure have several hundred ours of work behind them. It just doesn't make sense. Oh and I forgot to mention that nearly 50% of the "collectives" make $0/year. Meanwhile, OpenCollective is making ~$10k/year in fees (assuming the payment processor takes 3%). Bountysource lets you "back" a particular issue of a git project. Cool idea, however I see a few projects that misuse this where the owners simply post a bountysource link for every issue on the project and don't even reply (ie a few of the kivy projects) to issues unless they post a bounty. I kind of get it, time is money, but seriously? Way to slap potential users face and turn them away from a project. Anyways, let's see how bountysource adds up. If you sum up the totals of that "All" time bounty hunters you currently get $303k. It's been around since 2012 so that's about, hold your breath, $60k/year for the TOP 30 developers so average $2k/year (again a few outliers here skewing this) so it doesn't seem too bad. However, if you go into their stats (which is good they post!) then we see there's been roughly ~3500 active developers (less than half of which never return to the site year to year) over the past 4 years and the sum of all the paid out bounties since Q1 2013 is about $478k or about $120k/year meaning the average developer is earning, wait for it about $34/year lol. Meanwhile, BountySource is making ~$9k/year in fees (again assuming the payment processor takes 3%). In short, don't quit your day job. While these services may work depending on your project, a large majority of the time they're worth nothing to the developer(s) of a project. Don't get your hopes up with sites like these (that's not to say don't use them), just plan to get funding or sales through other means. They might be a way to get some money on the side if the project is something you have to build anyways! Feel free to comment with any better alternatives that may be out there!